Home / Events / Stop the Repression. NO NEW ARMY! The people of Haiti need our solidarity in the face of the increasing violence of the fraudulently imposed government of Jovenel Moise. Last Thursday July 14, 2017, in Petionville, Haiti, near Port-au-Prince, a young book vendor was shot to death by a police officer in front of horrified witnesses. The police used tear gas and batons against a crowd outraged by the murder and the quick, forcible removal of the body in a perceived attempt at a cover up. This is the latest of recent extra-judicial killings by the Haitian police and paramilitary forces. 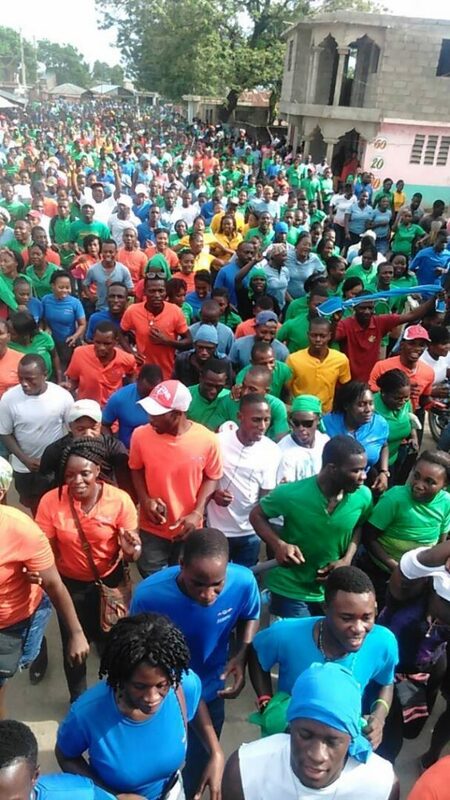 On July 10–12, 2017, during three days of peaceful protest for an increase in the minimum wage, Haitian police attacked the workers from the industrial park in Port-au-Prince with tear gas, batons and cannons shooting a liquid skin irritant. One of the beaten workers is a woman who had recently returned to work from giving birth. On June 12, the government-appointed rector of the Haitian State University used his car to hit and run over a protesting university student. The government prosecutor has ignored the complaint filed by the students against the rector and is instead pursuing the victim’s colleagues in a blatant attempt to harass and intimidate them. In May 2017, units of the Haitian police and paramilitary forces again attacked the people of Arcahaie protesting the government’s plan to remove the main revenue-generating district from the community, located about 30 miles northwest of Port-au-Prince. In May 2017, a food vendor in Petionville was killed after he was deliberately hit and run over by a car of the municipal paramilitary forces according to outraged witnesses. On March 20th, 2017, police officers were videotaped shooting at the car carrying President Aristide and Fanmi Lavalas presidential candidate Dr. Maryse Narcisse as they returned from court. The police officers were reportedly observed returning to the national palace; there was no condemnation of this blatant assassination attempt by the government. Hold the US and UN occupation accountable for the terror campaign by the Haitian police and security forces they train and supervise.